What is your annual mileage? What will be annual cost at $2.00 per gallon; $2.50 per gallon, $3.00 per gallon; $3.50 per gallon; $4.00 per gallon; $4.50 per gallon; and $5.00 per gallon? Total Pounds of Carbon Dioxide released into the atmosphere by you every year? If everyone is like you, calculate Total Gallons Used by 225,000,000 U.S. Cars per year! The instructor may add additional data for you to determine to complete this project. Research the Internet. And see if you can find additional information which follows: . In 2015, about 140.43 billion gallons (or about 3.34 billion barrels1) of gasoline were consumed2 in the United States, a daily average of about 384.74 million gallons (or about 9.16 million barrels per day).3 This was about 1.5% less than the record high of about 390 million gallons per day (or about 9.29 million barrels per day) consumed in 2007. 1 There are 42 U.S. gallons in a barrel. 2 EIA uses product supplied to represent approximate consumption of petroleum products. Product supplied measures the disappearance of these products from primary sources, such as refineries, natural gas processing plants, blending plants, pipelines, and bulk terminals. 3 Preliminary data for 2015. If you do not drive or own a vehicle and can not get cooperation from your family, the instructor will assigned an alternate energy demand project(My Electric Demand!) or you may earn 20 total points using the data of your instructor’s car (4 years). With improvements in vehicle fuel economy, U.S. drivers’ average gasoline consumption is the lowest it’s been in at least 30 years, according to research by the University of Michigan released today. 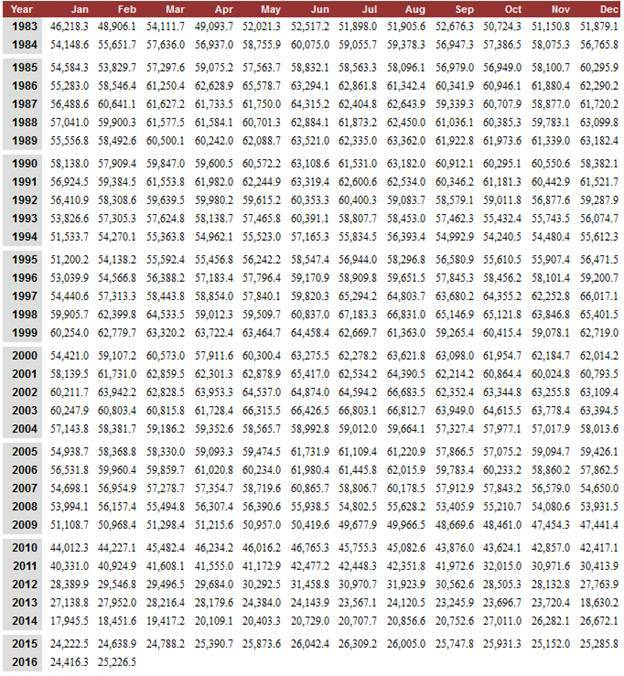 The number of gallons of gasoline used per person, driver, vehicle and household is below rates in 1984, when the study was first conducted, according to researcher Michael Sivak of the University of Michigan Transportation Research Institute. In 2013, gallons of gasoline consumed per person (392) fell 17 percent from 2004, gallons used per driver (583) fell 16 percent, and gallons used per household (1,011) fell 19 percent. 2004 was the year of maximum consumption for those categories. 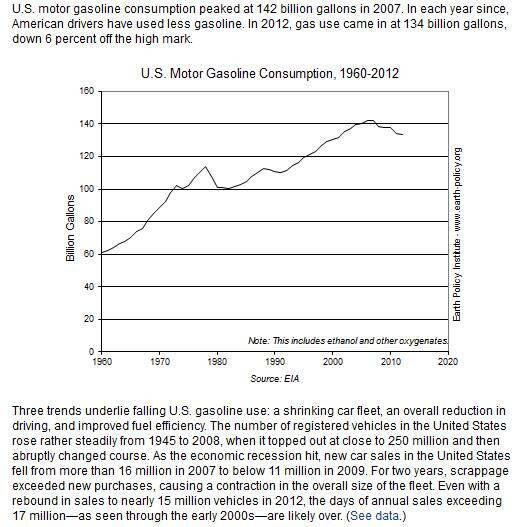 Gallons used per vehicle (524) dipped 14 percent from 2003, which was its maximum consumption year. Even though population grew 8 percent from 2004 to 2013, total fuel consumed by light vehicles decreased 11 percent, Sivak said in a statement. In 1984, annual fuel consumption rates were slightly higher than in 2013: 400 gallons per person, 608 gallons per driver, 602 gallons per vehicle and 1,106 gallons per household. The study also found that the number of vehicles and distance driven per person, driver, vehicle and household are at their lowest since the 1990s, the statement said. The declining number is driven not only by economic factors, but also rises in telecommuting and use of public transportation, Sivak said. “The reductions in the fuel-consumption rates reflect, in part, the added contribution of the improvements in vehicle fuel economy,” he said in a news release. “Per person, per driver and per household -- we now have fewer light-duty vehicles, we drive each of them less and we consume less fuel than in the past,” Sivak added. Sivak and fellow researcher Brandon Schoettle also compile an average fuel economy report each month.